Good Vibes Guest House would like to thank all of our guests that have enjoyed their time (and not so) with us. Times change and so will we. The original owners of the house have taken over to personally manage the property. Your good reviews have given us inspiration and the not so good ones as our tips to improve further. We hope to see you again soon in Ayo Homtel (formerly Good Vibes Guest House). The best starting point for any adventure. … a little story from where and how AYO Homtel began. 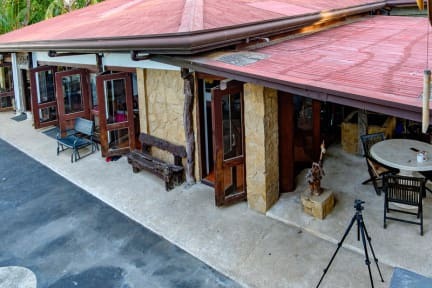 This Rustic Tropical Serene Home and Hostel was originally an 80’s house built by of a family who migrated to New Zealand in early 2000 just in time when a mother and her three children who also lived abroad looked for a house in Cebu to become their vacation home and establish their roots. With the help of a family friend, the late Architect Chris Abbu, the 80’s house was lovingly re-purposed but preserving the charm and vibe, adding more open spaces that set a seamless connection between the indoors and outdoors. The re-purposed house was then fondly called Kirana, “light of life” in Sanskrit which became their Christmas vacation home and repository of mementos gathered from different places, with each piece having its own story. Main door wood carvings was from old Javanese home, stone art was bought from a street artist in Ubud Bali, bench built out of old rail tracks from Medellin, Cebu. Indeed a fusion of pieces and stories from overseas and Cebu. As the three kids have grown, Kirana was less visited and the family, who are avid cultural and natural travelers themselves, decided to open it up as a second home to other travelers as well. AYO Homtel was then conceptualized, managed by the eldest son Gabriel. Rooms for family, group of friends or solo travelers were comfortably furnished, Wifi, parking, private and public comfort rooms, shower, lounging area and many more. Further facelifts were done to make it into an even better place to stay in. Breathtaking paintings were added such as the Big Hibiscus by Lyn Deutsch in the Living Area and flower paintings in the guest rooms by Nina (the owner’s niece) as well. 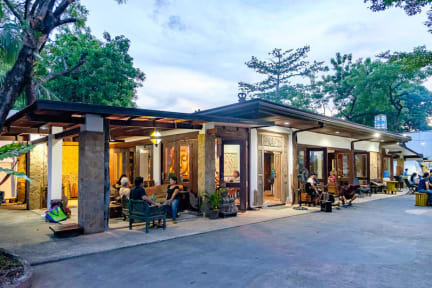 To give a Cebuano flair to the place, the name AYO was picked as it captures the Asian hospitality to welcome guests knocking. It also means “let’s go” in Indonesia where the three kids spent their growing up years. Wikipedia says Ayo means Joy in Yoruba (African language). Heel chill hostel als je op doorreis bent en naar het vliegveld moet. Super lieve mensen die er werken en heel schoon.